Earlier in this lesson I mentioned that I was going to discuss the difference between the wand and the dagger. Although the wand has traditionally been associated with the magickal element of Fire and the dagger has been associated with Air, some people, especially in recent years, have reversed these associations. 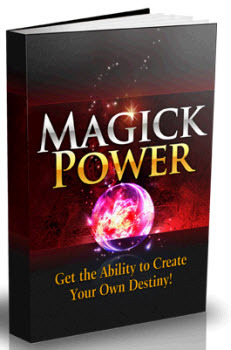 This is in a large part due to those people who have been using what they call Wicca or Witchcraft. 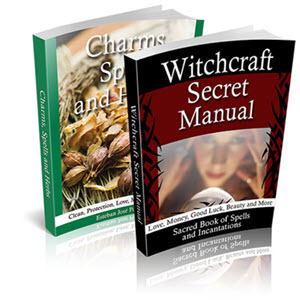 While it is true that Witchcraft is thousands of years old, it is also true that much of what is today called Witchcraft is either a creation of or a re-construction by the late Gerald B. Gardner. This is not meant to belittle anybody who follows a Pagan path. In fact, those who follow one of the various Pagan paths in many cases seem to have regained the link between humanity and nature that most Ceremonial Magicians only talk about and secretly envy. 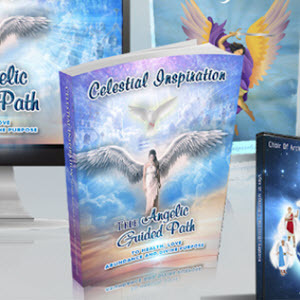 As you may have noticed, one of the important areas which this course has emphasized is the attunement to the elements, something which has been sadly lacking in most books or courses on High Magick. It is clear that Gardner simplified some seemingly complex magickal techniques and philosophy ("borrowed" from the ubiquitous A. Crowley). Then, with the help of Doreen Valiente they created modern Witchcraft. It does not matter whether or not he received initiation from the New Forest Witches as he claimed. Nor does it matter that many have gone far beyond his initial researches, training and techniques. For he has introduced many to a form of spirituality which could not be found elsewhere when he began his work. His contributions, thankfully, will last for many years to come. However, as I said, some of what Gardner did was a simplification of traditional magickal philosophy. One of these simplifications was the equating of the dagger with the sword. This is understandable as the sword does appear to be nothing more than a long dagger. And if you had only learned the LBRP, you might know that Me-chai-el bears a sword and stands to the South, the direction of the element Fire. Water, of course, would be associated with the Chalice, and Earth with the Pentacle. This leaves the wand to the element Air. 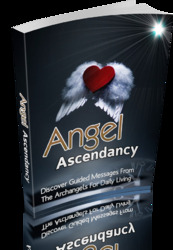 And Rah-fay-el, the Archangel of that element, does hold the caduceus wand. This all seems so logical. Unfortunately for the above simplification, it is not correct to equate the purposes of any of the several wands used by a magician. The Fire wand is not the same as the Lotus wand, and neither are those the same as the wands carried by the initiatic officers of occult groups. They all have different functions even though they have the same basic shape. So too is the dagger different in design and function than the magickal sword. If it helps to clear things in your mind, some people like to think of the dagger as being the tip of a spear which is thrown through the air. 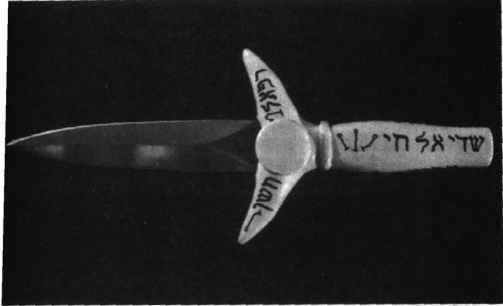 The traditional Air Dagger is a simple, double-edged blade with a "T" shaped handle as shown below. Since the Air Dagger should never have been used to cut living things, it should preferably be new, Undercoat the handle and the "T," but protect the blade from paint. Follow the instruction on the paint concerning the treatment of the wood and/or metal before applying the paint. Then paint the undercoated parts a bright yellow. On page 152 you will find a listing of the Hebrew words and sigils to be painted in bright purple or mauve around the handle and "t" cross bar. 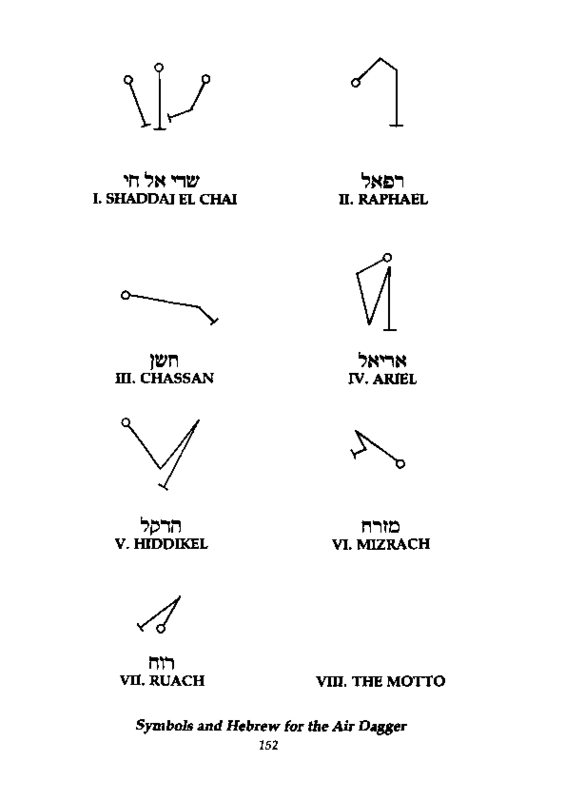 As you will see there are eight groups of these, the same number as for the Earth Pentacle. In fact, all of the tools will have eight sets of words and sigils. I have already discussed the motto (number VIII), so let's look at the others. I—is the God Name associated with the tool. HI—the name of the angel associated with the tool. IV—the name of the ruler of the element. V—there are said to be four rivers coming out of paradise. V names the river associated with the element. VI—is the name of the direction associated with the element and tool in Hebrew. VII—is the name of the element in Hebrew. After completing the painting, coat the handle with a clear plastic such as varathane. Note that the above numeration will stay the same for all of the tools. Let me make clear that this course is presenting traditional Western occultism. From this standpoint, other associations are incorrect. However, within their own systems, other attributions may be totally correct and the traditional system presented here would be "in error." The only moral of this paragraph, if I can call it that, is if you do not totally understand the system you are using, do not mix it with other systems. It will only cause you problems. This is not to say that you cannot blend multiple systems once they are fully comprehended. That was a prime achievement of the Golden Dawn. On the other hand, I am aware of a person who could not get involved in a Western magickal group (although he tried), then didn't like the Wiccan group he became involved with because it did not have the same magickal traditions. One was too complicated and the other too easy. The result is that he has formed his own "Ancient Cabalistic Celtic Coven." My only regrets are for the students he is "teaching" and the problems they may have in the future. It is said that, "When the student is ready the teacher will appear." Unfortunately, this is true even when the student is ready to be mis-taught. Part of your work for this lesson is the construction of the Air Dagger as described. It is not expected that your art work will hit the level of a da Vinci or Michelangelo, only that it be done to the best of your abilities. How to make an air dagger golden dawn? Why is the wand associated with the south in the golden dawn? How make wand of fire golden dawn? Can a air dagger of golden dawn be plastic?